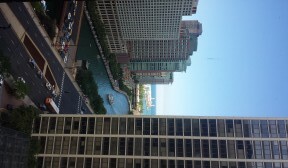 Over the fourth of July weekend, my wife and I took a vacation with some friends to the great city of Chicago, staying at a Hyatt Regency downtown. One might think I would have chosen a different hotel based upon my last experience, but another member of our party made the reservation so I sucked it up. At least I knew what to expect this time. During the check in process, one of the receptionists asked if we wanted to upgrade to a room with a view for $20 a night. All three couples in our group agreed to the upgrade, unfortunately they were unable to get us all right next to each other. Not thinking it was really a big deal, we headed to our rooms. Once inside our hotel room, my wife instantly opened our curtains revealing an angled view between buildings of the Chicago River, Navy Pier, and Lake Michigan. Personally, I thought it was pretty cool, but my wife was dissatisfied. She became even more unhappy with our view when we visited the room of another couple in our group and saw their view. Because they were located a little further over, their view was straight down the river. It really was a spectacular view. Two days later when we checked out, the receptionist asked the obligatory question to ensure everything was satisfactory. My wife stated that everything with the room was great, but had she seen ahead of time the view we were given for the $20 per night upgrade, we wouldn’t have done it. Additionally, our friends’ room was set up slightly differently to accentuate the view, making it the focus point of the room. She said it very nicely, and didn’t really expect any action since we did stay in the room, and it wasn’t like we had a view of a brick wall. â€œI’ve gone ahead and taken that $40 charge off for you,â€ he said to her surprise. This specific instance wasn’t really about saving money. If that were the objective we wouldn’t have upgraded to begin with. But it’s all about being satisfied with what you pay for. If you pay $20 extra per night for a room with a view, you should be happy with the view you get. My wife wasn’t satsified, and as usual, we didn’t pay for it. Have you ever asked for a hotel charge to be removed because you weren’t happy with the service? Did it work? It was really nice of them doing that. Nowadays it’s harder to retain customers, so customer satisfaction is most businesses’ top priority. I can’t think of any instance when I’m not satisfied with a service, but I guess this is something to keep in mind, to voice your dissatisfaction if you’re unhappy with the service! One time on vacation we were in a room facing west so the sun came right through the window and heated the room to very uncomfortable temp. It was in Alaska and the days are verrrrry long there in the summer so lots of time for the room to be quite warm. At check out I complained very nicely simply saying the next time we stayed there we would specify an east facing room. The hotel clerk took 20% off our bill. 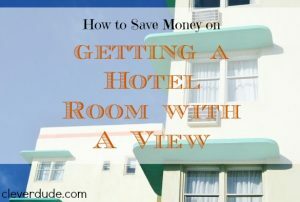 I think the fact that I spoke in an non-confrontational tone and indicated a plan to return to the hotel in the future made it easier for them to give the discount. (BTW, I had already used our AAA card to get a 10% discount when we booked the room so the whole stay was discounted by a total of 30%)! @Kathy – that’s great – 20% off is a significant discount. I’m almost positive my wife wouldn’t have got to checkout without speaking to someone and having us moved. LOL. I wish I had the guts to speak up about things like that!I never do and therefore it never pays off. Your wife is a money saving machine! I am not one for views at hotel rooms (I’m never, ever in the room so it goes to waste) but there have been other things that I could have been more vocal about.